The National Chairman of the Peoples Democratic Party (PDP), Uche Secondus has said the All Progressives Congress (APC) was scared of going into the 2019 election. He declared that the ruling party knows it was staring at defeat. 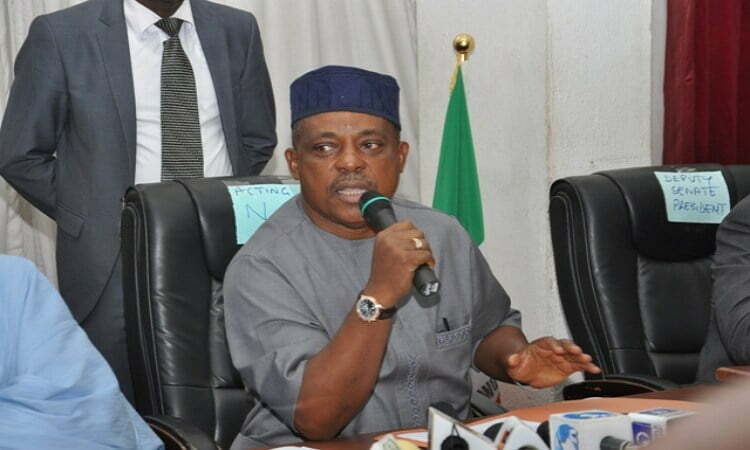 Secondus said this when Bayelsa Governor Seriake Dickson and his reconciliation committee submitted their recommendations to him in Abuja on Thursday. He said the APC had become a threat to national security and declared the resolve of his leadership to galvanise Nigerians to displace the APC. The chairman boasted that the PDP under his leadership has been rebranded and repositioned, stressing that the recent PDP rally in Jigawa, an APC state was a testimony to the fact that Nigerians now own the PDP. “The APC is a threat to national security. The APC-led Federal Government is broken. The APC has so disunited our people and Nigerians no longer trust it. “Only the PDP rekindles hope; the party represents the labour of our heroes past; only PDP can secure and keep this country united. “That is why our emphasis is on returning the party to Nigerians especially women and youths and I want to seize this opportunity to call on all Nigerians including those who have left us to return to the party. “PDP belongs to all Nigerians and our party is the only party that is not owned by an individual or a cabal. We shall provide level-playing field for all aspirants to actualise their ambitions unhindered. “We are ready to bend backward to accommodate everybody including those who have left us. The PDP is ready for a robust arrangement to lead other political parties to form government at all levels to banish hunger, insecurity, nepotism and clannishness from Nigeria! “The 2019 general election is a referendum on the survival of the country. APC and INEC will try to rig but they cannot succeed. Nigerians will resist them,” he said.